The Hare is considered sacred amongst many ancient traditions, representing fertility and rebirth, associated with the moon, and the festivals of Spring. From the earliest times, people have seen the image of a hare when they look at the full moon. 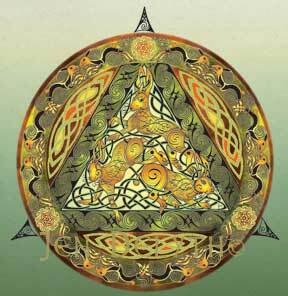 The Hare was sacred to the moon goddess Andraste, the Celtic goddess Cerridwen and the Earth Mother. Considered to be a royal animal, the warrior queen Boudicca released a Hare as a good omen before each battle with the Romans, and it was said to have screamed like a woman from beneath her cloak. Reknowned for their astounding fertility - one doe can bear 42 young in one year, the Hare is hunted by nearly every predator including man, yet continues to survive and prosper. In earliest times killing and eating the Hare was taboo: in Kerry it is said that eating a Hare is like eating your grandmother. This restriction was lifted at the Celtic Festival of Beltane. Eostre (or Ostara) was an Anglo-Saxon goddess of the Dawning East, and of Springtime (from whom we derive the name for Easter), and she was believed to have taken the form of a rabbit, or white hare, which is her totem creature.